A work of art elicits emotion, supplicates mysterious and often unknown spirits from within, and ultimately uplifts one’s life from the daily drudgery of systems (ironically put in place by all of us to begin with). What I’m saying, for Christ’s sake, is that after reading dear Petrov, you will be a better person. Ok, maybe for a limited time (hopefully forever if you’re fortunate), but that still counts. The book is written from the perspective of an un-named female narrator in 19th century Russia in the form of her musings to Petrov—a husband, a lover, a soulmate, a friend—all of which are alluded to in beautiful, elegant, deliberate language. Petrov is sometimes here with us (or, rather, with her), but often he is away—a soldier or likely an officer called to duty on the front of an un-named war (Crimean? Russo-Turkish? The January Uprising?). The woman is alone mostly, left behind in her spacious manor far from any city or town. She lives by a taciturn lake with a looming mountain in the not too far off distance—a great sinuous link between living stillness and dynamic force (more on the importance of nature in dear Petrov later). There is the deep isolation and beauty that is quintessential Russia oozing through the book, and Tepper’s construction of the woman’s voice from her musings to or about Petrov, aduces the Russian loneliness and melancholy so beautifully invoked by Chekhov, Tolstoy, and the contemporary Russian author (and my current favourite) Andrei Makine. Petrov is a persistent character. He is indefectible, almost indestructible. In many ways he reminds us of Klamm, the elusive and highly influential official/bureaucrat from Kafka’s The Castle. Petrov exerts authority not just over the narrator, but over us…the readers. He looms all throughout the book. We can sense him all throughout. His lover tells us so. It’s important that we smell Petrov. His boots, his breath, his body. What is his scent? She tells us. I love Petrov as much as I love his woman, who is constructing him for us piece by piece, letter by letter, and who is as complex as he…nyet, even more so. Petrov is an addictive enigma. He drinks whisky, not vodka as one would expect any Russian to. In fact, only one time—very late in the book, in its penultimate piece, “Instructions”—does Petrov ever drink vodka. And even then it’s not quite clear. His lover writes: “I have left instructions. A letter on the porch table. Your name on the envelope in purple ink. The table with the scalloped glass placed over its cracked top. The one [on which] you slammed the vodka down during some fitful rage.” Did he drink it or did he smash the bottle? Who in Hell is Petrov? She tells us. And we love and suffer along with her. Earth and nature in all their various forms—decaying, blooming, dying, growing—play an integral part in this work. We are taken through cyclical seasons filled with warmth, frigid Siberian winds, rain, snow, short days, long nights…we walk along with our guide on mossy earth, wet leaves, soft soil, fallen petals, loam and clay…“cobblestones soaked in the bloods of history.” It is visceral and intellectual, all mixed up in our chests. Our storyteller has only one companion (aside from solitude) when her soldier is away: her horse. He is her friend, confidante, sometimes saviour. She rides him through the gargantuan rooms at gallop’s speed, hoping to outrun her fears “of the beginning and the end.” Is he real or is he a myth. Is he a symbol of Petrov’s sexuality. Nothing is quite clear. 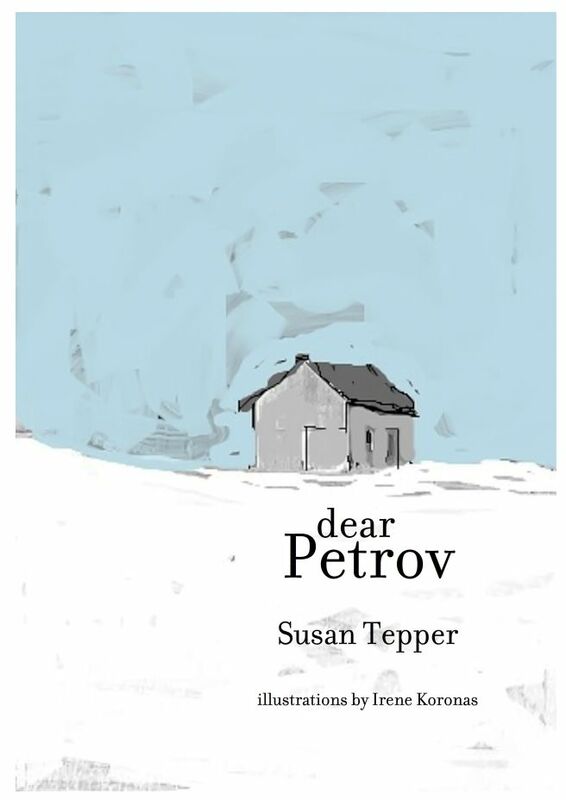 She is consumed by all that is Petrov, and as she weaves out her story to us letter by letter we begin to wonder: how much suffering can this woman bear in her complete devotion. See what just happened there (and here). I asked a question but did not use a question mark. Tepper utilizes this device brilliantly in her book, in effect not giving us a choice or chance, really, to answer the multitude of queries the narrator puts forth, but just let them wash over and into us. We become her with every question she does not ask, but instead puts forth. This is wonderful control of narrative by a seasoned, mature writer. This is storytelling at its finest. Possibly my favourite of all the “chapters” in dear Petrov is “Liver.” This most resilient organ has always fascinated me. It has always held some kind of riddle that seems to double as the foggy, mystical no man’s land between life and death. The liver, as you know, takes merciless toxic jabs from within our bodies only to turn them into harmless substances and release them. The times I’ve eaten liver I’ve felt a strange, universal harmony inside my breast between that which lives and that which does not—quite the opposite of dining on heart, which literally supplies life and can make one feel immortal, even for the moment. And that is war. That is the war that Petrov is summoned to. That is the war that permeates his lover’s life, as she confesses all her fears and desires and nightmares to us. As she waits. That is the war we all make for ourselves to go and die in. Our beds. Made. ALEX PRUTEANU is the author of the novella Short Lean Cuts and Gears, a collection of stories from Independent Talent Group. Both books are available at Amazon, Barnes & Noble, and Powell's Books. He has published fiction in Guernica, [PANK], Specter Literary Magazine, The Prague Revue, The Stockholm Review of Literature, and others.